Gendate Valley (厳立峡) is located Osaka, Gifu Prefecture. The entire valley was formed by the lava of Mt. Ontake. It is popular hiking courses which you can enjoy waterfalls. Gandate Rock which located at the entrance of the valley is Natural Monument of Japan. 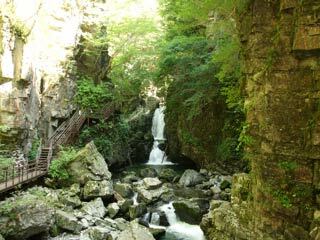 Gandate Valley is also known as Mitsu Falls' Courses which is one of 13 hiking and sightseeing courses of Osaka Waterfalls.